Moodle is the world’s most popular and widely used open source learning management system (LMS) in the world today with over 45,000 registered sites, 32 million users, 3 million courses in over 200 countries in 75 languages. 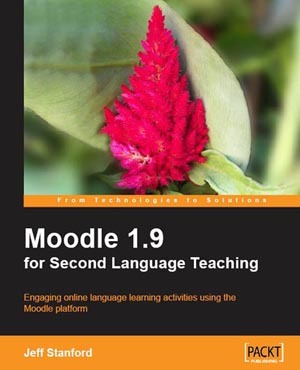 In his book, Moodle 1.9 for Second Language Teaching, Jeff Stanford introduces Moodle as an easy to use, highly adaptable and very effective platform for teaching second languages. What does Moodle offer language teachers? If you are a DoS, Academic Director, Head of Faculty or a teacher who is interested in learning how to leverage the powerful tools for learning available in the Web 2.0 environment, this book is an excellent starting point. It gets you up and running in no time, whatever your previous experience of using web based learning tools might be. The format is open and modular so that you can adopt Moodle 1.9 as a platform for your elearning requirements in steps and at a pace that is comfortable and practical for your organisation and your learners. Jeff Stanford is an Associate tutor in Applied Linguistics for the University of Leicester and a teacher trainer on Cambridge ESOL courses. He also does training consultancy work for organizations such as Anglia Assessment, Fintra, Pearson, and the British Council.